A quaint village of skilled craftsmen and little in the way of major upheaval... until some terrible affliction embraced the whole of the village and left it in ruins, its residents forever changed. In all of the time since the reappearance of the village, one of several long-standing questions never answered revolves around how Velathae came to be in its current state. Why are the villagers unable to pass through the Gate? Where did all of their corpses go to? And why were so many areas of the village ruined, burned, or just plain missing? 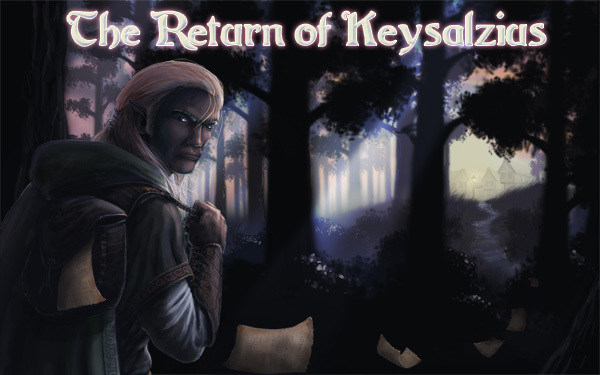 When Velathae was not a part of some shadow world, when it was still a part of the living land, Keysalzius walked its streets and interacted with its residents. When it met its tragic fate, the elf, like everyone else, was mystified and spent many a long night seeking answers. He came up with little in the way of satisfying research, but he continued to have a great interest in the village's events. Learn the early histories of Velathae here! The Merchant Consortium of Greater Elanith has once again negotiated with the ghostly residents of the village of Velathae to house this year's Ebon Gate event. Visitors to the village may find many wonders, both natural and supernatural, at their fingertips to enjoy. The village of Velathae offers numerous delights and wonders that will surely entertain visitors for hours. Several hosted games by one of the local ghostly residents will happen throughout the entire weekly event. Also, why do the residents find the belfry tower so curious? Certainly, this is a mystery worth looking into! The games in the orchard are varied and numerous as the apples that grow on the trees -- this year, some of the favorites are back: Sing Me an Epitaph, Bubbling Brew, What Was I?, Entrails Toss, and Creepy Anagrams. Visitors beware, however, as the spirits of the orchard are a feisty bunch and are unpredictable. Bodily harm may occur. The old Villa Macellarius has been reported to have odd occurrences happening to it since the manifestation of the village. Visitors can explore the villa but are cautioned to stay alert. The wealthy inhabitants of Winter Wren Estates have not been heard from since the devastation to the village; however, the ghostly residents of Velathae have talked about strange sightings within the community. Take a wander past the estates, and knock on a door or two -- you may get an answer. Be sure to keep an eye on the FESTIVAL command in game as it is updated with information for visitors to Velathae!